I am always looking for easy week night dinners to make, its hard finding the motivation to cook a labor intensive dish after a long day of work! Pork Tenderloin is a lean, healthy and flavorful alternative to chicken or steak. I find that pork tenderloin is always tender and moist (sorry I hate the word moist but there’s really no other way to describe it!) Anyways… this is a super easy dish and the sauce is good over just about any meat (chicken or steak!) Serve the pork along side some root vegetables and brown rice and dinner is done! Enjoy! Pre-heat oven to 400 degrees. Season the pork tenderloin with olive oil, salt and pepper (this can be done right before or a few hours in advance- cover with plastic wrap and refrigerate). In a skillet with a little olive oil, sear Pork on all sides until brown. Remove from the pan and place on a foiled and greased baking sheet. Bake for 15-20 minutes or until a meat thermometer reads 150 degrees. Meanwhile, melt butter in medium sauce pan. Add broth and tarragon and cook over high heat for about 10 minutes until it reduces a bit. Whisk in cream and cook until thickened, 3-4 minutes (be sure to watch it and continue stirring at this point- it bubbles over easily!) Whisk in mustard. Gradually whisk in flour (add 1 tablespoon of flour for thick sauce or leave out all together if you prefer a thinner sauce). Serve with brown rice or quinoa. Enjoy! 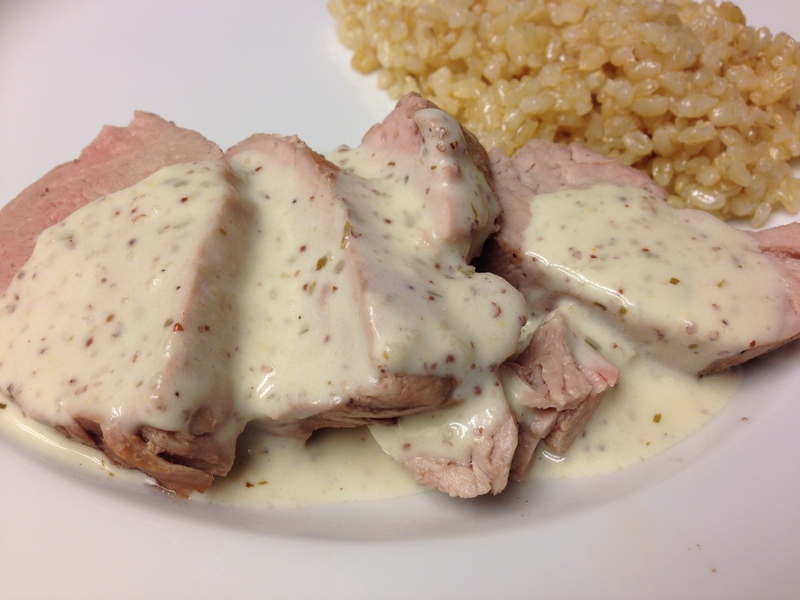 This entry was posted in Entrees, Recipes and tagged cream sauce, mustard, pork tenderloin, tarragon by skibootsinthekitchen. Bookmark the permalink.